As you may know this year I really tried to focus with Hazel on the true meaning of Christmas and not all the commercialism. To see some of the things we did you can check out my post with the Focus on the Nativity Blog Hop here. We also went to a live nativity which I highly recommend. Anyway, with our focus on it and going to church (my favorite time is Advent since I love all the Christmas music and stories), my mind has been on the Virgin Mary. Now I should add that the sermon at church the Sunday before Christmas was about Mary, so it was planted in my head. The sermon was on the true personality of Mary. She is always portrayed as obedient and good, however doing what Gabriel asked was a huge sacrifice and could have caused her death. Plus we tend to overlook that she was an unwed pregnant teenager when we look at her as a role model for our children. However this is not my focus of my thoughts completely tonight. 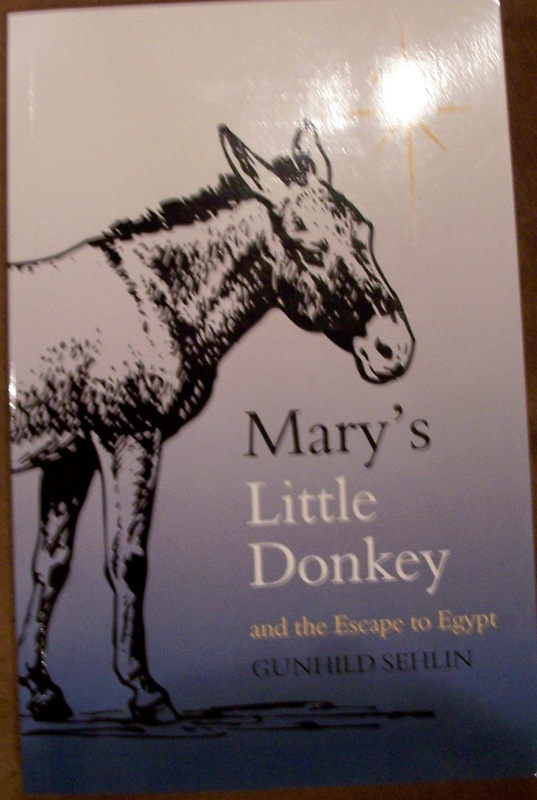 Now right before Christmas I bought the book Mary's Little Donkey and the Escape to Egypt by Gunhild Sehlin. I bought it when I was visiting my parents and one of my favorite places to go while there is the Community of Jesus' gift shop, The Priory. Hazel and I had gone over to check out their new nativity--bigger than life and the faces were done after some of the members and of course while checking it out we had to go into the Priory to see what there was. Now just think about a place with homemade soaps, candles, jams, knitted items, jewelry and books and religious music CD's. It is so relaxing to walk in. You hear the wonderful music and get the smells. Almost all of their items (besides books and maybe some CD's) are made by members. It is a great place to find some nice gifts as well. Mary's Little Donkey is about the donkey that Joseph buys Mary so she can have help during her pregnancy and of course for their big journey. In the book, all of the animals love Mary and she treats them all so well and with such tender loving care. Even her wild birds follow her to Bethlehem so they will be near her for the birth of her baby. The story goes through many places where God sends them angels sometimes seen only by the donkey to help them on their journeys (to Bethlehem, Egypt and home). Also Mary's nature changes lives of people they encounter. Reading this wonderful book made me really wonder what Mary was like. I also started to think about what her life must have been like. I think about all the things I feel about being a mother and imagine what it would be like to know that your child is the Son of God. 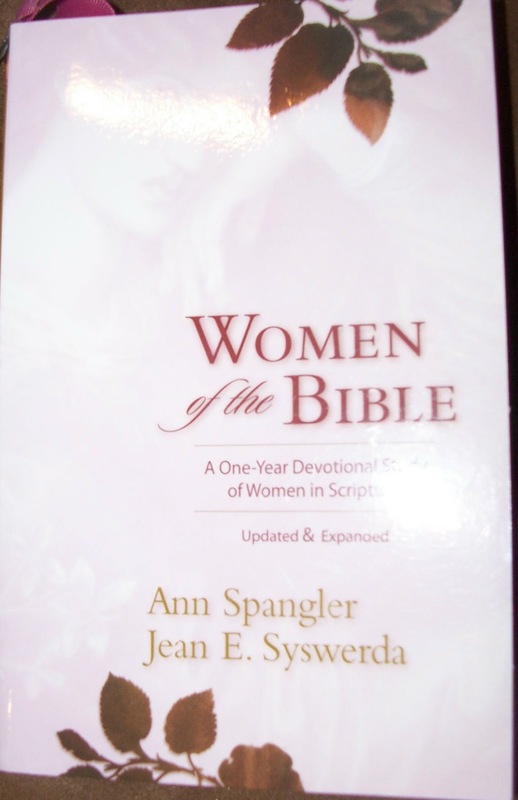 I actually pulled out another great book I got from the Priory a few years ago, Women of the Bible by Ann Spangler and Jean E. Syswerda. 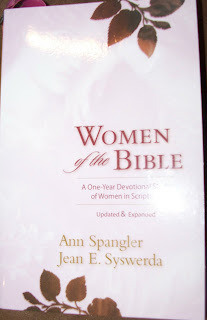 My church has run a Women's Bible Study with this book for the past two Lents. 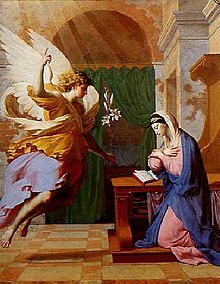 I quickly read the section on Mary, but am planning on doing it again in more detail and actually doing it as a week long meditation. Now I think about my pregnancy the happiness, the pains, the bedrest, etc. Imagine what it must have been like for any woman in biblical times and then for Mary. She is caring God's child! I know I was nervous when driving, etc. because I did not want to do anything to hurt my unborn baby. Here is a woman who has to keep the housework up including going to the well, etc. without the conveniences of today. It was a rough life to begin with but I cannot imagine it pregnant or knowing the importance of her baby. Nevermind the long journey to Bethlehem on a donkey when she is due any day. Now imagine the birth. Some say since she was a virgin she did not have the curse of Eve, so I would interpret that to mean not a painful birth (which I would hope considering the circumstances and the visitors). 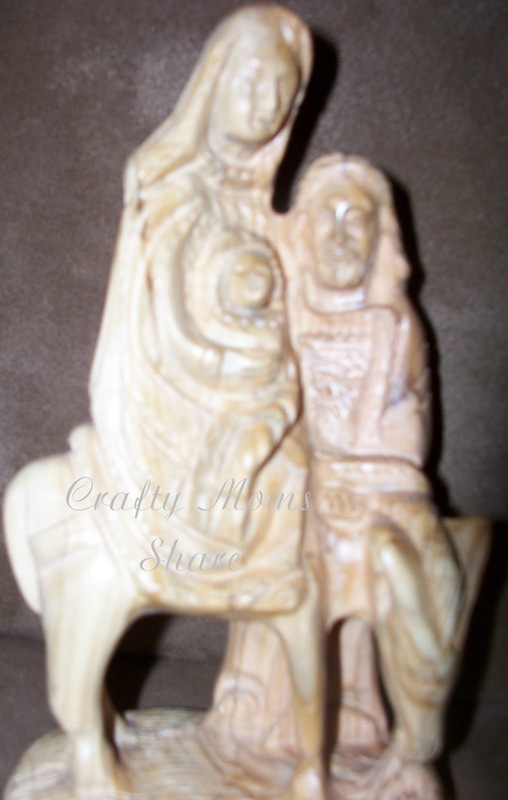 Then having the shepherds come to find her baby after hearing the news from angels. Then the Magi. What amazing events and to be there thinking this is for my child. These strangers are bringing your child gifts that are worth more than you and your husband own! Of course than there is the escape to Egypt. Taking your young newborn on a donkey ride through a desert. That does not sound fun to me. But her faith got her through it. And of course then the return home as well. Another long ride. Once he begins to grow up, her child realizes who He is. Then she watches as He can perform miracles. Imagine being at the wedding an asking your child to do something about them running out of wine. Watching with pride as He makes sure nothing goes wrong on their friends' special day. And then the sadness of watching your son betrayed by his friends and killed by your government. Watching his left breath, but knowing before he died he tries to give you peace and take care of you even as he hangs on the cross. And then the resurrection. Seeing your child who died again alive. The happiness she must have felt. The pride of it all. Or course there is all the ascension. Knowing your child is truly what God promised and your role in his life. What an amazing feeling that must have been. Ok, so have you ever spent time wondering what it was like to be Mary? Compare your own feelings for motherhood with what hers might have been? I think it is so interesting. Oh, and at the sermon, the minister asked how you would respond to Gabriel if he came and asked you to be the Virgin Mother. His guess was most people would say find someone else. However, I do think I would do it. Would you? I've always wanted to see a live nativity, maybe next year. So beautiful to see you celebrating the women of the bible with your daughter. If you'd like to join our photo friday blog hop, we'd love to have you over. Cheers!